Cucumber plant pollination by hand is desirable and necessary in some situations. Bumble bees and honeybees, the most effective pollinators of cucumbers, usually transfer pollen from male flowers to the female to create fruits and vegetables. Multiple visits from the bees are required for good fruit set and properly shaped cucumbers. 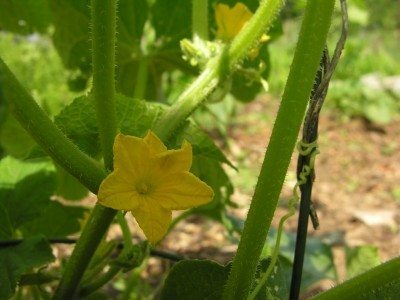 Cucumber pollination may be lacking in the garden where many varieties of vegetables are planted, as cucumbers aren’t a favorite vegetable of pollinators. Without their pollination, you may get deformed cucumbers, slow growing cucumbers or even no cucumber fruit at all. 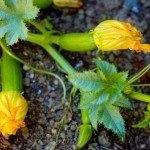 If bees and other pollinating insects move on to more attractive vegetables, hand pollinating cucumbers can be your best chance at a successful crop. Excluding natural pollinators and using hand pollination of cucumbers can often produce more and larger cucumbers in the garden. This method of cucumber plant pollination involves waiting to pollinate until later flowers develop, as early flowers on young vines may produce inferior cucumbers. Early blooms may be exclusively male. The practice of hand pollinating cucumbers allows vines to grow and have more productive female flowers, usually 11 days or more after blooms begin. 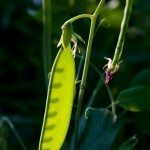 Cucumber plant pollination, when done by hand, can be time-consuming, but if a crop of large, mature cucumber is desired, hand pollinating cucumbers is often the best way to get them. Learning to recognize the difference between male and female flowers is the most important aspect of hand pollination of cucumbers. Both grow on the same plant. Male flowers differ in appearance from female flowers by having shorter stems and growing in clusters of three to five, while the female flower blooms singly; alone, one per stalk. Female flowers contain a small ovary in the center; male flowers lack this. The female flower will have a small fruit at the base of her stem. When hand pollinating cucumbers, use only fresh male flowers. Flowers open in the morning and pollen is only viable during that day. Locate the yellow pollen inside of male flowers. Remove the pollen with a small, clean artist’s brush or break the flower off and carefully remove the petals. Roll the yellow pollen on the male anther onto the stigma in the center of the female flower. Pollen is sticky, so expect cucumber plant pollination to be a tedious and painstaking process. One male anther can pollinate several females. When completed, you have accomplished cucumber plant pollination. This process should be repeated for effective hand pollination of cucumber. Once you have mastered the art of how to pollinate cucumber, look forward to an abundant crop. 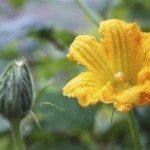 Techniques used in hand pollinating cucumbers also allow you to hand pollinate squash and melons in the same way.